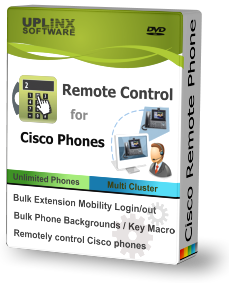 The Uplinx Remote Phone Control Tool's bulk Extension Mobility wizard has been designed for Cisco administrators and deployment engineers to perform batch operations on Cisco Extension Mobility. A typical usage scenario is to log out phones, migrate to a new Cisco server and log in the Cisco end users on the new CUCM cluster. This feature can be very convenient in migration scenarios for Cisco end users as they do not need to be aware of server changes and do not need to perform manual log-ins. The Bulk Extension Mobility wizard can be used to migrate users from one server to another without the end user manually logging in. For new locations or end users, the created device profiles, which have been created in Cisco CUCM BAT, might be logged into phones without engaging end users. A command file (in CSV format generated in Excel) can be processed by the Bulk Extension Mobility wizard or, alternatively, a command file can be used and generated by the UPLINX Phone Control Tool during log-in, log-out or get-status command operations. The Bulk Extension Mobility wizard, along with all other bulk features, requires a Professional license and is not included on the Standard license. Get the logged-in user and Extension Mobility status for a group of phones: Export the current logged-in status, the user-id and Cisco device profile per phone to a CSV file. The CSV file serves as command file so that these end users can be logged out or logged in on these or other phones. Log out end users from Cisco phones: Use a CSV command file to log out Cisco end users in bulk. Log in end users to Cisco phones: Use a CSV command file to log in Cisco end users in bulk. To get started, download your trial version now and follow the steps to Bulk Extension Mobility for Cisco phones.